Mardi Himal Trek is a short and adventurous trekking route to the lowest and least visited. Mt. Mardi Himal in the Annapurna region is situated just to the south of Mt. Machhapuchhre, popularly known as Fishtail Mountain. Few trekkers have visited the valley and the ridge to the south of Mardi Himal. Mardi Himal trek also offers the golden sunrise view over the famous mountain Machhapuchare. Machhapuchhre or Fishtail Mountain is sacred to the Queen of Nepal and has never been climbed. Your trek in the Annapurna region will show you this most picturesque of all peaks from many different angles. New Mardi Himal Trek is the name of the long rising ridge and its summit at 5,580 m, that forms the southwesterly slope of Mt. Machhapuchhre immediately below its sheer south face. Machhapuchhre towers majestically over the very good valley in Pokhara is best known as Fishtail Mountain because of its twin peaks that mirror the image of the fishtail. It is superbly beautiful and is considered sacred, so no permits have yet been issued to climb this mountain. On your arrival at the airport, we will pick you up and transfer you to the hotel. The very next morning, after breakfast you will be taken for a full day sightseeing tour around Kathmandu valley. You can visit the center of pilgrimage Pashupatinath Temple and Swyambhunath, very ancient and essentially enlisted in UNESCO World Heritage sites. The biggest Buddhist Stupa at Boudhanath might make you feel calm and peace. This day, after having breakfast, we take 30 minutes flight over the Himalayas or we take the private vehicle to Pokhara. On route to Pokhara, we can see country and landscape of Nepal. In afternoon you are free to explore the Pokhara. This day, after breakfast we drive to Phedi. From Phedi trail start ascending through the jungle and highland rice fields generally, walk up to the valley of Dhampus and Pothana with exploring. The area is inhabited by Brahmins, Chhetris, and few Gurungs. Crossing the dirt road a couple of times and stone staircases make the trail more adventuring. The spectacular panoramic view of Annapurna Himalayan range makes your trip much greater. 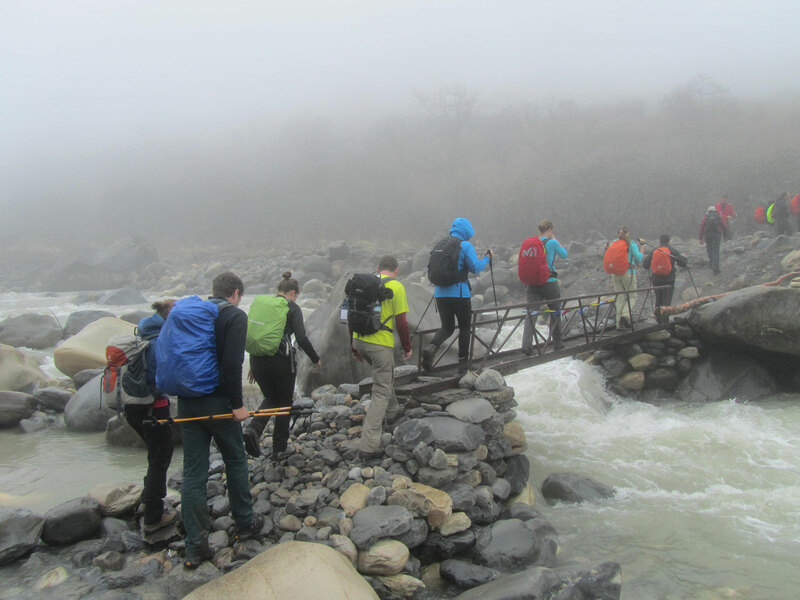 Trek start through gradually up with forest and rocky wall, exploring the view of Machhapuchhare and Annapurna Himal. As we climb, the flora has turned to classic ‘cloud forest’ with mosses and lichen, tree ferns and orchids hosted by the hardier trees. There are windows in the woods that look out onto the thrilling panorama – close up the dramatic scenery of sacred Mt. Machhapuchhare, Mardi Himal, and Annapurna chains. Just a short, steep climb and we are out of the forest. A ridge, now grassy and sometimes under snow, takes us up to High Camp. Annapurna South seems near enough to throw a rock at and Machhapuchare itself close enough to touch. Our breakfast will be earlier than usual. Then we take a packed lunch as we are hiking to Mardi Himal base camp. The great ice fields and blue glaciers of the Sanctuary Wall lie below. Annapurna I, highest of all is beyond, and around us, and an arc from horizon to horizon, from Dhaulagiri to the Ganesh Himal, are a dozen or more glistening snow-bound giants. And return back to High Camp. After breakfast, Trail descent down approximately 1600m from High camp with a different route than the previous route. The trail leads through the shade of the forest, terrace field and walks along the banks of Mardi Khola to the hillside village of Siding Village. This day, we trek about 4 hrs and 2 hrs drive to Pokhara. The path from Siding now follows the contour of the river valley gradually down between the pastures and through Tamang and Gurung villages. You can have greetings exchanging among friends and buy some souvenirs. This day, after breakfast you are free until the time of your departure and transfer to the airport for your onward destination.